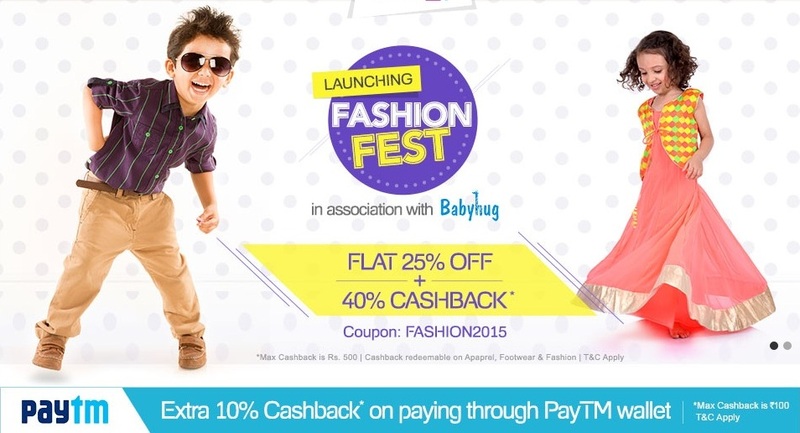 Firstcry has launched Fashion Fest sale in association with Babyhug on apparel, footwear and fashion. It gives Flat 25% discount and 40% cashback when you use the coupon code 'FASHION2015'. You can also get Extra 10% cashback when you pay through Paytm wallet. Check the terms and conditions before ordering. 3. Sign in if you are an existing user or register if you are a new user. 4. Apply coupon code 'FASHION2015' to avail Flat 25% discount and 40% cashback. You can get additional 10% cashback if you pay through Paytm Wallet. 1. Check Firstcry's terms and conditions on Fashion Fest here. 2. Valid from 5th October 2015 to 19th October 2015. 3. Paytm Cashback will be auto-credited to your Paytm wallet within 24 hours. 4. Use Firstcry coupon code 'FASHION2015' to enjoy the discount.